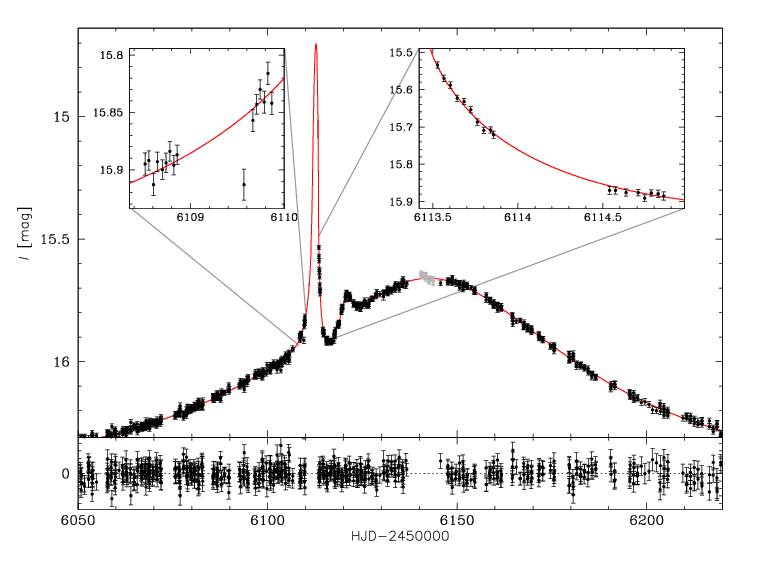 The microlensing event OGLE-2012-BLG-0406 showed clear anomalies deviating from the standard point source point lens light curve. We analyzed OGLE data for this event and showed that these anomalies were caused by a planet. The light curve of the event with microlensing fit is presented below. OGLE data reaveled not only the existence of a planet but also allowed constraining the planet orbital motion. Figure below presentes the derived geometry of the system. Black dot represents the lensing star, crosses mark the position of the source at moments of time when images were collected. The position of the caustics (lines), source (open circles) and planet (filled circels) are shown for three epochs which truncated HJD is provided. The source star is the bulge red clump giant. Using measured color and brightness we estimated angular radius of the source. 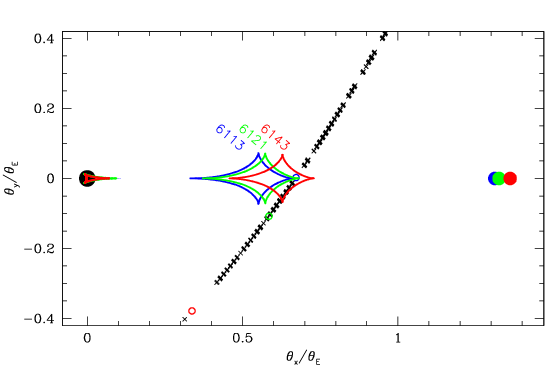 This coupled with microlensing parameters gave estimates on the physical parameters of the system. The planet OGLE-2012-BLG-0406Lb is a 3.9 MJup mass object orbiting 0.6 MSun mass star. During the event the projected separation of the planet from the star was 3.9 AU i.e., much larger than the snow line distance. This challenges the core accretion planetary formation theory, which does not predict super-Jupiters to form beyond the snow line of low-mass stars.